Wildlife Galore With Ducks, Herons And More! Recently renovated darling studio cottage (500 sq ft) Beautifully appointed. King size temperpedic. Comfy living area with big screen TV/surround sound. Kitchenette with toaster oven/microwave/Coffee maker/ BBQ. Condiments. Separate bath with stalls shower. Electric fireplace creates a warm ambience. 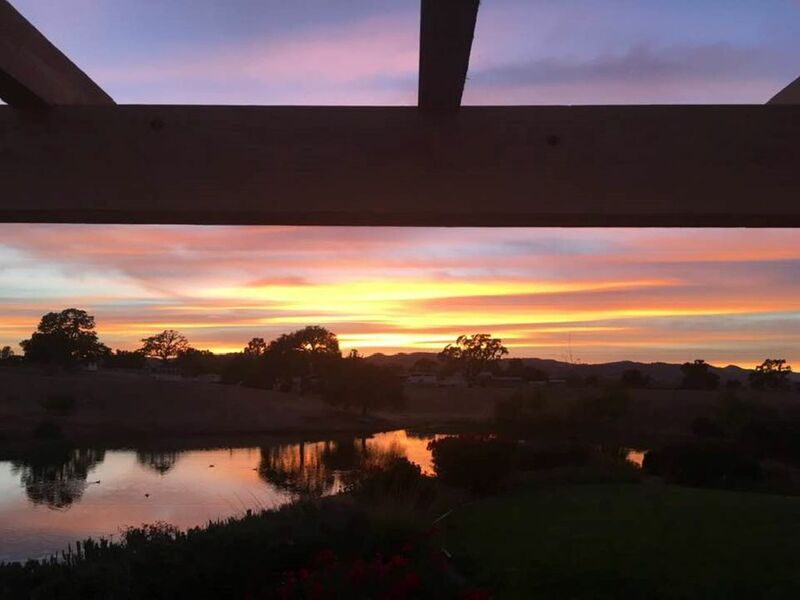 3 french doors open to the pool area on one side and to the covered patio on the west side where you can sit by the fire pit and enjoy our incredible sunsets reflected in the 3 acre private lake. Wildlife galore with Ducks, Herons and more. You'll feel like your 500 miles from civilization yet your only 5 minutes from town. 5 minutes from Vina Robles our world class concert venue! Casa De Oro el sol. The house of the golden Sunsets! This is an accommodation for two guests only and is in a private gated community. Lovers getaway? Anniversary surprise? The current pictures do not show the draperies recently installed, not the coffee table with top that elevates to provide a dining area. Also not showing is the 42 inch smart TV with sound bar and sub-woofer. Viewable from the sitting area as well as the sleeping. As we share ownership of the lake with other owners here it is not available for any on the water activities. The pool is available from noon to 6PM. Parking for one vehicle. Because of the shared private neighborhood we live in, no events are allowed, nor additional guests. Being respectful of the adjacent neighbors is always appreciated.